This beer began as pure experiment. It has become an obsession. The entire reason I started brewing beer is to incorporate foraged elements into the brew. Mostly this means adding either wild adjunct grains, like wild rice, or botanical additions that contribute flavor. I do this with fresh, green fir tips in my fir tip ale, and with juniper berries in my NorCal gose beer. Anyone who knows me know I love the aroma and flavor of juniper. Well, as it happens, juniper berries are coated in wild yeast. Yeast that can brew beer. Working with wild yeast is an adventure. The bloom on grapes, plums and juniper berries is a clear indicator that wild yeasts are present (the bloom itself is not yeast, however, it’s a waxy substance that just tells you the wee yeasties are present.) Most fruits have yeast on them, as do most flowers. Harvesting that yeast is as simple as dropping the fruit into something fermentable. Like beer wort. I did this with some juniper berries I’d gathered in the high Sierra Nevadas. The same berries I made the gose from. Only this time I dropped them into a test wort — really some leftover I had from an experiment with a wild rice ale; that experiment continues. Sure enough, I got a nice ferment! It smelled nice, and I tasted the resulting beer, and it was good, even when flat. So I ramped up the experiment and made a gallon tester batch. I added a bunch of chopped up needles from our local bull pine, Pinus Sabiniana, and when the beer was ready to bottle, a touch of 88% lactic acid I’d bought from the brew shop, as well as some oak chips I’d boiled first, so they would not add any other microbes to the party. Why? It just seemed right. And it was. 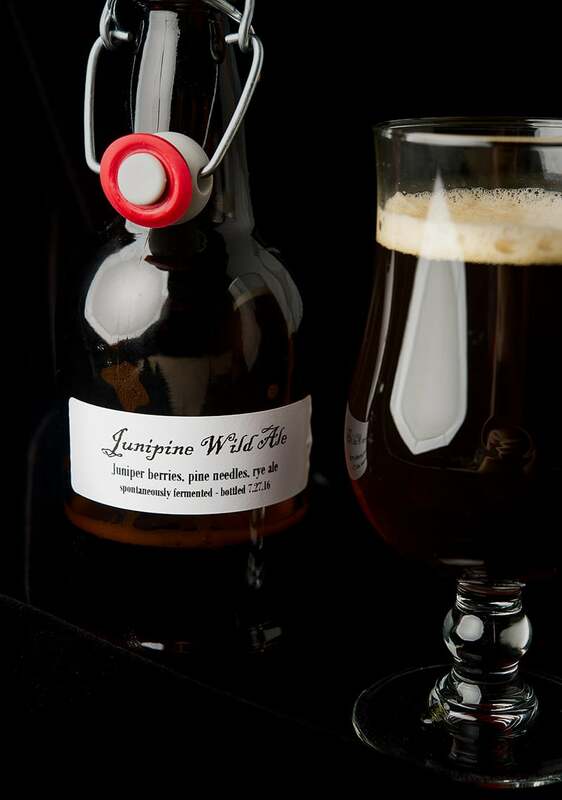 I brought Junipine to Sam Horne’s, a local beer geek bar in Folsom, California where I hang out at. I gathered some influential beer people: brewers as well as serious connoisseurs. Everyone thought this was my best beer yet. Drinking this beer will transport you into a cool Sierra Nevada day. You can absolutely pick up both the pine and juniper. The yeast character is there, but not so strong as it is in, say, a saison. It is a largely red ale, hearty without being overly malty or hoppy. The oak is subtle, adding a little backbone and vanilla — but you’d never know it was there if I didn’t tell you. Finally, the lactic acid is not nearly enough to make this a proper sour beer, but it seems to amplify all the music coming from the glass. Junipine is the best beer I’ve yet made. 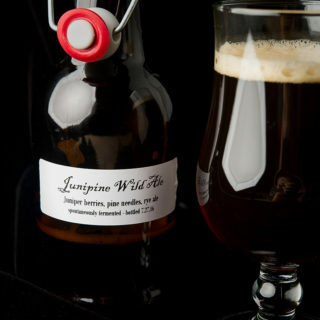 Here’s how you can make your own version of a juniper wild ale. A large pot, or several slightly smaller ones. I used a regular stockpot plus another soup pot before I got a brew kettle. Something to ferment in. I prefer glass carboys, which are large jugs, but some people prefer buckets. An airlock. You need to keep air off the fermenting beer at the same time you let CO2 escape. The airlock does the trick. A strainer. A fine-meshed strainer removes debris, called trub, and the stray bits of seasoning and hops. Bottles, caps and a capper, or a kegging system. And, of course, you need malt and hops. Your nearest homebrew store will have all of this stuff, or you can buy it online. Boil about 3 cups malt extract (I used light dry malt extract), then cool it to about 85°F. Cover whatever container you are using. If a Mason jar, screw on the lid just barely. Put in a cool, dark place and check it every day. Shake it around. In two to four days, you should see yeast activity. 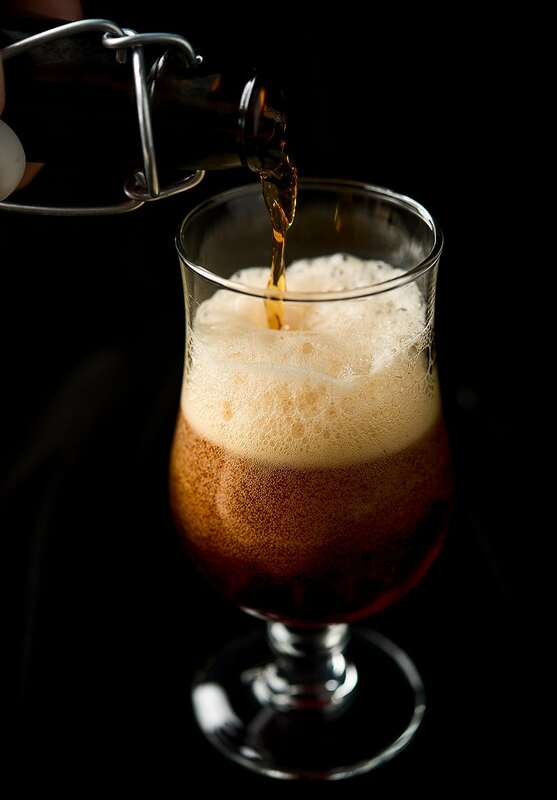 This is a red ale with moderate carbonation, a slight bit of tartness -- but not enough to make it a true sour -- and with strong aromas of juniper, with a backnote of pine. I am still primarily an extract brewer, but feel free to modify this to be an all-grain ale if you want to. One alternative in terms of malt is to use Munich instead of Maris Otter, which I did in the first incarnation of this beer. Note that the yeast on my juniper berries is slow and steady, so you should not need a blow-off tube. Steep the Special B malt. Put the malt into a grain bag or tie it up loosely in cheesecloth and cover it with 3 quarts of water. Bring this to 155°F to 165°F over medium heat and hold it at this temperature for 1 hour. Remove the bag and set it over the pot in a strainer. Pour 2 quarts of water heated to 170°F over it to rinse the grain. Let the bag drain for 10 minutes, then remove. Discard the grain or feed it to animals. Start the boil. Add 2 more gallons of water to the pot and bring this to a boil. Add the hops and set the timer for 1 hour. With 30 minutes to go, add all the extracts and stir well. If you are using it, add the Whirlfloc to the boil along with the wort chiller, if you have one. This will sanitize the chiller. With 5 minutes to go, add half the juniper berries. Knockout. Turn off the heat and add the final addition of juniper berries along with the chopped pine needles. Crash chill the wort. Use your wort chiller to chill the wort back to 75°F or cooler, depending on how warm your tap water is. Or, put the pot in a cooler with lots of ice water in it. Use a clean spoon to create a whirlpool in the wort, which will help it chill faster. Hopefully you will see gnarly bits in the wort that look like egg drop soup, or separating miso in soup: That's cold crash trub, and seeing it means you will have a clearer beer. Move the wort to the fermentor. Add the juniper yeast starter to the fermentor; I use a glass carboy. Pour the contents of the pot through a sanitized strainer into the fermentor. If the strainer gets all gunked up with trub, remove it before continuing. Put a sanitized airlock on the fermentor and put the beer in a place where it can ferment cool, ideally 66°F to 69°F. Leave it there for 2 weeks. Add the boiled oak chips to a new sanitized carboy and rack the beer into it. I do this only if there is a lot of crud in the fermentor. If it's OK, I just add the oak chips to the primary fermentor. Either way, let the beer finish fermenting for 10 more days. Bottle or keg the beer. If you are bottling, you want to add enough priming sugar to the batch to get about 2 volumes of CO2, about 1.8 ounces or 51 grams for 3 gallons. Add the lactic acid to the bottling bucket. Bottle condition the ale 2 weeks before opening the first bottle. This beer ages well. This is so great, and creative. Question: I hunt and forage at a recational property in centeral Texas. We have endless ashe juniper trees. They have blue berries. Deer love them. Are these the same juniper berries you are using? Sean: Same family, different species.